Does anyone else get fed up of hearing how great John Lennon and how he was the only important member of The Beatles? Well, the bad news is it’s only going to get worse. After Sam Taylor-Wood’s film “Nowhere Boy” last year and Christopher Eccleston’s performance in Lennon Naked earlier this year, we’re dangerously close to the 30th anniversary of John Lennon’s death and an opportunity to wallow in the worst of his mawkish, maudlin post-Beatles work. I can feel a BBC 4 themed Friday night coming on already: “Imagine – The Philosophy of John Lennon”, “Working Class Hero – a John Lennon Biography” and maybe some good old Beatles footage. “Imagine no possessions, I wonder if you can”? While we’re doing hypocritical, what about “Working Class Hero”? John Lennon was brought up in a safe middle class environment (Ringo was actually the only genuinely working class Beatle) with his Auntie Mimi in Woolton, a very middle class area of Liverpool, and Auntie Mimi was unashamedly middle class. You can’t blame John Lennon for the things that other artists do to his songs, but it was covered in 1979 by Marianne Faithfull on her “Broken English” album, and that’s about as far from working class as you can get. Don’t let the media drip-feed you this sanitised version of John Lennon as a saint and proponent of world peace and equality. Listen to some of his great Beatles songs like “A Day in the Life”, “Strawberry Fields Forever” and “Lucy in the Sky with Diamonds” and hear the real genius. 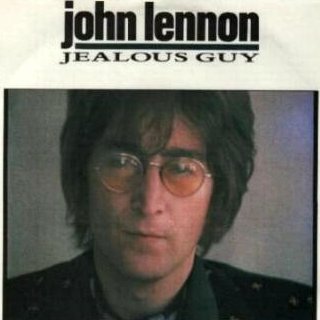 Even in his career as a solo artist, he wrote “Jealous Guy”, a wonderful confessional song where he admits to his faults in relationships. John Lennon was a genius, but a flawed genius. Don’t be conned by the sanitised version that you’ll be hearing in a few months. Listen to his Beatles songs; listen to “Jealous Guy“, but please don’t listen to “Imagine” or “Working Class Hero”. I always hate it when people try to “percentage up” Paul/John’s importance when it came to songwriting. The songs were great when they worked together but I am repulsed by their post beatles efforts. Apart from a couple of decent tracks here and there (Live and Let Die, Jealous guy) it was (and still is in Paul’s case) pale in comparison to the good old days. So it isn’t just me then.